This book concentrates primarily on the two best features of the Atari - graphics and sound - exactly what's needed to code computer games. Deals primarily with examples in BASIC, but does include on machine code example. Covers, drawing figures on the screen, movements in BASIC and machine code, movements of missiles, overlap and collision detection, sound and programming the joystick. 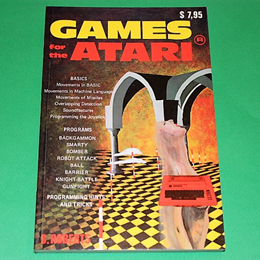 A 114 page paperback in very good condition.full example games, all listed and explained.